On the morning of Feb. 23, 2012, history was made when Dr. Fabrizio Mancini, a doctor of chiropractic and the president of Parker University in Dallas, Texas, and Dr. Patrick DeFazio, a Los Angeles doctor of chiropractic, were filmed for an upcoming episode of the "Dr. Phil" show at Paramount Studios in Hollywood, Calif. This was chiropractic's first appearance on the popular daytime talk show, which is broadcast on 220 television stations across the U.S. and in more than 40 countries worldwide. 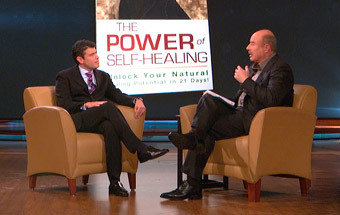 Nearly 21 million viewers tune in weekly to hear the advice given by Dr. Phil McGraw, a clinical psychologist with 25 years in practice, and the show's online presence is over 2 million unique viewers/followers per day. The show took an interesting turn when a man named Joe was introduced and came out in a wheelchair. Joe was only 5 years old when a drunk driver crashed into the family car, killing his father and sister, leaving both his legs paralyzed. It was clear that Joe was still very hurt and angry about the accident, particularly toward the woman who had caused him and his family so much pain. As the show wound down, Dr. Phil thanked both Dr. Mancini and Dr. DeFazio for taking care of him over the years. He then thanked the audience and let them know they would each receive a copy of Dr. Mancini's book, which elicited a huge cheer from the audience. After the show, a number of people working on the set asked about how to find a local chiropractor or remarked how much they had learned about the value of chiropractic. This was in addition to the many members of the audience who talked about chiropractic and asked Dr. Mancini to autograph their copy of his book. This was an important positive event for chiropractic. The audience heard about chiropractic, the wellness philosophy and that Dr. Phil sees his doctor of chiropractic more than once a week. They were also taught that chiropractic can play a role in the health of everyone, including someone who is paralyzed. With its March 14 airing, a global audience will have the opportunity to learn about the power ofchiropractic care. Over the past nine years, the "Dr. Phil" show has received 21 Emmy nominations and won five PRISM Awards. In addition to generating more than 15,000 hours of television programming, Dr. Phil McGraw has authored six #1 New York Times best-sellers, published in 39 languages with more than 24 million copies in print.